HYDE — Perennial Mountain League champion or contender Philipsburg-Osceola rode Kam Harris’ pitching and a 12-hit attack to a 12-2 victory over the Clearfield Area High School softball team at the Bison Sports Complex Tuesday. Walks and errors also were factors in the winless Lady Bison’s seventh loss. Six of the 10 Lady Mounties who received free passes came around to score. Two of the six miscues led directly to three unearned runs, and two others gave extra opportunities to the top of the Philipsburg-Osceola batting order. Like in the first inning when Abby Fedder, who battled control problems throughout her 3-1/3 innings in the circle, walked two of the first three batters she faced. Maggie Peck scored on a wild pitch and Jayde Burge followed with an RBI single through the middle. What proved to be the winning run was no gift, though. Peck put a charge on a low, pitcher’s pitch for a home run, lifting it over the fence in left center field. Even though Harris was breezing along, allowing one hit through three innings, Lewis wasn’t upset at being down 3-0. “I was happy with the kids. We were close,” he said. Three free passes around Hannah Thompson’s single off backpedaling shortstop Brooke Cline’s glove produced a run before Madison Lucas ended Fedder’s stint with a line drive to center for two runs. Reliever Erica Hanes also had trouble finding the strike zone, walking the next two batters. Burge scored on a wild pitch, and pinch-hitter Kyleigh Kennedy’s pop fly fell behind first base to drive in Lucas with the fifth run of the inning and an 8-0 lead. “Our two pitchers have to continue to grow, and they have to get better at hitting their marks,” Lewis said. “I think they’re aware of that. They may be pressing a little bit. “The two of them haven’t pitched horribly, but in the same respect, they’ve gotta show they’re growing out there and realize they’re the ones in control. The Lady Bison bunched three of their hits for their runs in the bottom of the fourth. Kyra Mollura and Cline singled, the latter moving up on the throw to third base, and both scored on Aspen Bishop’s sharp single into center field. Infield misplays were costly in the last two innings as the Lady Mounties closed out their fifth win with pairs of runs, only one recorded as earned off Hanes. Peck and Harris had RBI singles in the sixth and Kylie Thal delivered a two-run single in the seventh. “Defensively, we have to be better than what we are,” Lewis said. “People are going to put the ball in play on us, and we have to make the plays when we’re expected to make the plays. Joining Peck in the two-hit column were Harris and Lucas. Harris set down the Lady Bison in order four times and finished with seven strikeouts, five on called third strikes, and no walks. 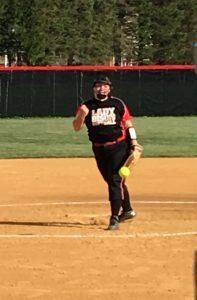 The Lady Bison will be at home again Thursday to take on Central at 4:30 p.m.
Mountain League Standings – Bellefonte 6-0, Central 5-1, Philipsburg-Osceola 4-1, Bald Eagle Area 3-3, Huntingdon 3-3, Penns Valley 2-4, Tyrone 1-6, Clearfield 0-6. Maggie Peck 1b 3322, Hannah Thompson ss 5110, Kam Harris p 2221, Jayde Burge 3b 4112, Madison Lucas rf 4122, Adria Lewis ph 1100, Rachel Simpson dp 2000, Sadie Granville 2b (flex) 2110, Kylie Thal c 2012, Allyson Fenton ph 1000, Kendra Carns cf 3100, Kyleigh Kennedy ph 1011, Kaleigh Taylor ph-cf 1000, Angie Kost lf 3000, Kylie Adams lf 1110. TOTALS: 35 12 12 10. Erica Hanes 2b-p 3000, Kyra Mollura 3b 3110, Kirstin Norman 3b 0000, Brooke Cline ss 3110, Aspen Bishop lf 3012, Abby Fedder p-2b 2000, Skyler Bumbarger ph 1000, Makayla Ross 1b 3010, Maddie Lewis pr 0000, Karly Rumsky c 3000, Lindsay Hand rf 0000, Kate Lansberry ph 1000. TOTALS: 26 2 5 2. E – Mollura, Cline 2, Ross, Rumsky 2. DP – Clearfield 1 (Hand, Cline, Sartin and Norman). LOB – Clearfield 3; Philipsburg-Osceola 12. 2B – Harris, Adams. HR – Peck. Sac – Hand. Philipsburg-Osceola – Harris 7 IP, 5 H, 2 R, 2 ER, 0 BB, 7 K.
Clearfield – Fedder 3-1/3 IP, 6 H, 8 R, 8 ER, 6 BB, 3 K; Hanes 3-2/3 IP, 6 H, 4 R, 1 ER, 4 BB. WP – Fedder 4, Hanes 3. W – Harris (5-1). LP – Fedder (0-6). Umpires – Colleen Shannon (plate) and Rob Murphy (bases).